Here is Princess Beauty #2. It is going to Iowa and I am going to Washington State! My little sister who has been my nanny for a year now has decided to go home. One Vegas summer was enough for her! I will be out of the "office" from tomorrow afternoon until March 12th. If you need to contact me (or place an order) I will be near a computer the entire time and I'll have my phone with me as well. This dress was a standard order. 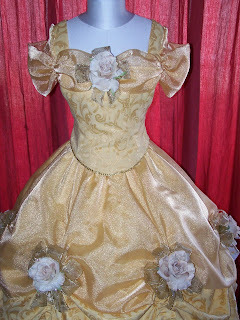 It will be worn by 3 princesses who are relatively close in sizes. (They vary by about 3 inches.) 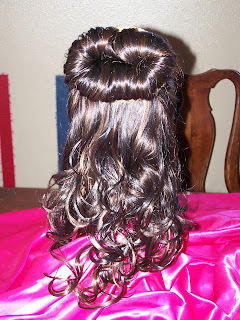 She also ordered the wig, gloves and a crinoline. Have a beautiful day and I'll keep in touch over my vacation! 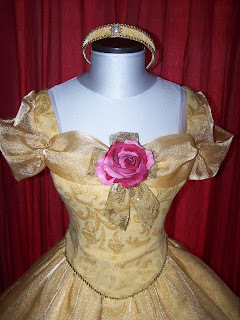 I finished the Princess Beauty dress for NY! She requested a couple alterations. One is the color of the flowers she asked for mauve, I think I got close. The other is the neckline, she wanted it to be a little lower. 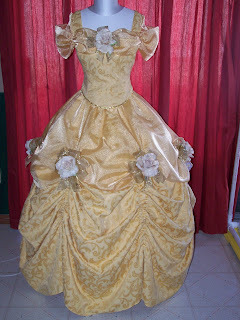 I made the dress about an inch lower and the "collar" smaller. 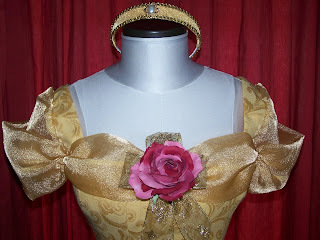 I like the smaller collar but I'm not sure how it will look on a bigger dress. This one is a size 0/2. Here are the pictures, Enjoy! Now I'm off to finish the other one. I called the sewing machine place today just to find out where my machine was at in the getting fixed process and they were like, oh yeah it's here, it's been here for a day or so, it's still in the box they sent it back in. I asked if there was something else that had to be done or could I come pick it up and they said come and get it! Yay for me! I don't have to figure out how to do a four step buttonhole after all. I probably wouldn't have had to anyway my sweet friend read my blog and offered her machine with the automatic buttonhole function. 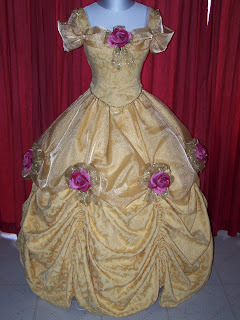 The skirts are together, the head pieces are done, one rose for each dress is done, the bodices are just over 1/3 complete and the projects are on track. Now I just have to hope that the fix will hold, it's the 3rd time I've had the same part fail. If it breaks again I'm moving on to another brand! The 2 skirts are about 2/3 the way put together. I have to cut out the waistbands and then put it all together. I'm trying something new because the skirts are SO heavy. I used to put an elastic waistband on but it wasn't the best plan so now I'm going to try a one like Cinderella with multiple hooks. I think losing a little adjustability will help it will stay on better. Tonight during Biggest Loser (I'm a big reality TV junkie, Jeopardy is my favorite show) I'm going to make the headpieces and put together the roses that pin on. 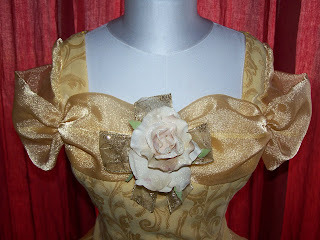 Tomorrow I start the bodices, I usually do them first but I put them off because my machine is in the shop. It has been acting up on and off for several months so I'm using my back up and I have to figure out how to do buttonholes on it, I have a feeling it will be an adventure. My machine has an automatic buttonholer, the back up does not. I don't think anyone who isn't me will notice, that is the plan anyhow. I hope to have the one headed to NY done by the end of the week because she needs it the end of next week. The one headed to Iowa is still on track for next Tuesday. It's really convenient to have 2 of the same dress at the same time. I don't have to change thread colors on my machine or my serger. Okay, now you're all caught up! This year has started out a little bit slow, which I was beginning to be concerned about. That is until last week. 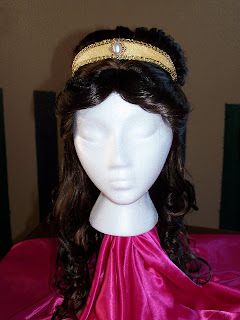 I got an order for a Princess Beauty with a deposit. I also got 2 emails from customers interested in dresses but neither one sent a deposit. The first person to email me had to wait for her princess to send in measurements and the second person to email is a brand new customer wanting something I've never done before, it looks fun. Both people were given the same tentative ship date but I wouldn't be able to deliver all 3 dresses on the same day. The most I can do in my busy life is 2 a week. Person #1 finally got the measurements and sent in her deposit, so I had to tell person #2 that her ship date has to change to 3 weeks later. When I have to do this it does make me feel bad that I have to let people down. I work on a first come first serve basis and I know deposits are hard to come up with and waiting can be nerve wracking but keep in mind someday you might be the lucky person who gets the deposit in first. If there is ever an event you need a dress for please tell me in your first email and I will see what I can do to accommodate your event. Thanks for all the understanding. I'm off to cut out 2 Princesses Beauty! I've been asked more than once by customers and casual observers alike "What are you working on now? When will your current project be done? and What do you have up next?" Here is a spot that will answer those questions. I will do my best to keep it updated with what I'm working on now and how finished products turn out. It will also showcase the special requests that I get asked to make and the process that making them involves. I hope this will keep everyone better informed and maybe it will also give you ideas of what you want your next custom creation to be!